Melbourne, Australia, March 29, 2019 --(PR.com)-- Edalex, an educational technology company, has been selected to join Amazon’s AWS EdStart Program. 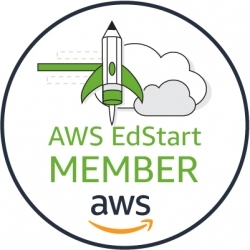 AWS EdStart is a program designed to help innovative companies build the next generation of online learning, analytics, and education management solutions, incorporating cloud technologies. Edalex’s submission focused on two key investment areas: its existing EdalexCloud offering that delivers a SaaS experience with the openEQUELLA digital repository, and a new suite of services: Edalex Content Services (ECS). "We've been using Edalex hosting for 3 years now. We have been very impressed with their expert technical advice and the responsiveness of their support team," said Francis Ramirez, eLearning Advisor, Australian Catholic University. "EdalexCloud will surely impress newcomers into openEQUELLA, too!" ECS will introduce modular, cloud-based extensions to existing educational technology platforms. The first two services are Edalex Video and Edalex Autotag, launching in mid 2019, and being developed in close consultation with educational design partners. These services will incorporate machine learning and other cloud services to deliver new functionality and increased usability to the openEQUELLA platform. Membership in the EdStart program provides access to training, mentoring, marketing and other support from Amazon that aims to accelerate investments by Edalex. To learn more about Edalex, visit edalex.com. AWS EdStart is the AWS educational technology (EdTech) startup accelerator program that helps startup EdTech companies build teaching and learning solutions on the AWS Cloud. The program is designed to enable EdTech startups to move faster and help develop the next generation of online learning, analytics, and campus management solutions. The AWS EdStart program seeks startups that solve a current problem or disrupts current educational models. Benefits include AWS promotional credits, office hours, training, and community forums. Edalex delivers a range of services for the education sector. With deep expertise in the educational technology sector, and strong engagement with local educational institutions, Edalex delivers proven results for both clients and partners. Edalex is the official Asia Pacific services and support provider for the open source repository openEQUELLA, is the exclusive ANZ reseller and support partner for both the FullMeasure data-driven mobile engagement platform, and Interfolio’s Faculty Information System. Find out more at edalex.com.